Guilton Forge Garage Ltd. was founded in June 1970, initially purchasing the old blacksmiths building in Poulton Lane. The current Managing Director of Guilton Forge Garage, Mr. W.J. Ralph, was one of the original three Directors/Shareholders of the company. The freehold of the adjoining Agricultural Contractors buildings was bought early in 1972 and the Body shop side of the business was expanded rapidly into these buildings, mainly through the painting of Commercial vehicles for the rapidly expanding transport and sales companies then in the area. 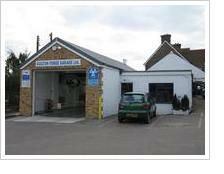 The business expanded initially on body repair, and MOT testing was started in 1979. The company then had four Directors and a further eight employees. From this early formative upheaval, the company management has continued, seeing the resignation / retirement of three Directors over the 40 year period, and the appointment of just one, but no reduction in the labour force which remains at eight. The most notable change since then has been the development and expansion of the MOT testing and servicing departments, which are now the main parts of the busines. This section now encompasses most of the "New Technology" areas such as air conditioning service/repair and electronic diagnostics. A recent expansion to the MOT bay and the renewal/updating of the testing equipment has enabled us to achieve the status of an ATL (Automated Test Lane). The company has been a member of the RMIF (Retail Motor Industry Federation) since 1980 and subscribes to their Repair Quality Assurance scheme and also their MOT Quality assurance scheme. Through our approval as a Unipart Car Care centre we have more recently achieved the British Standards Institute “Kitemark” Quality Assurance qualification and also subscribe to the Motor Industry Code of Practice.